Rif: CO.109 - Cogne. 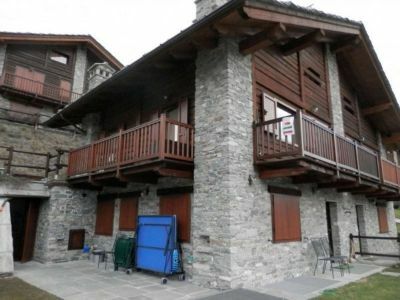 In the sunny village of Gimillan dominant the Cogne Valley overlooking the Gran Paradiso, semi-detached house on three levels which can accommodate two families in two apartments separati. Piano floor: large room with fireplace, kitchen , two bedrooms and two bathrooms. Garden of the property on two lati. Al upper floor is located a living room with fireplace, kitchen and dining area, bathroom and utility room with washing machine. Balcony on two lati. Inoltre same floor is located a second garden with caminetto. A attic floor is located a double bedroom with exposed beams and a bagno. A completion of the property there are three boxes and a large room storage / workroom.